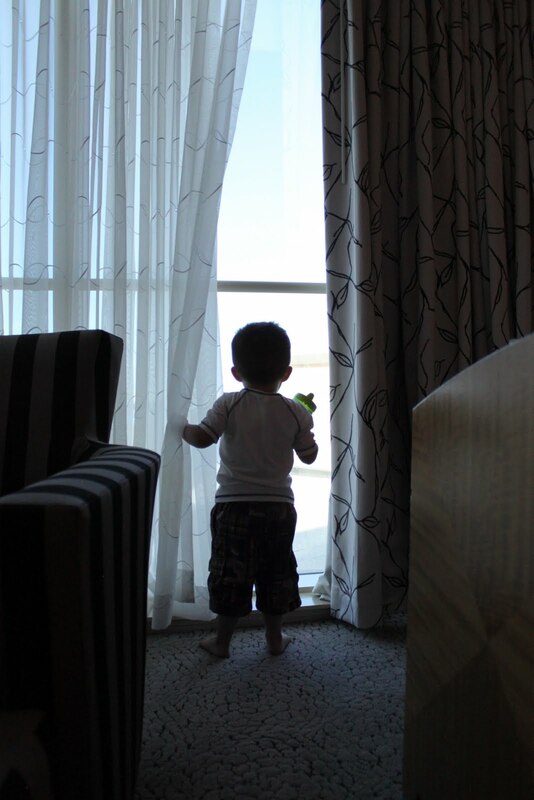 Our first night in a hotel with the boys was a big success. I set the boys up in pack and plays. One was ours from home - the other was lent to us by the hotel. The hotel one was perfectly clean - but it still skeeved me out so I covered it entirely with sheets from home. Not just the mattress but all the sides. Why? Umm, because I'm crazy? Come on, don't you know me by now? *wink* I also covered most of the top with a sheet and secured it with chip clips so it stayed pulled tight. 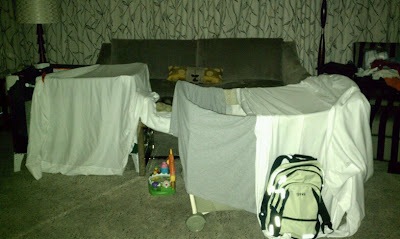 That was to keep it from being too drafty - I didn't want the boys to be cold while they slept. I'm always freezing in hotel rooms! The boys went right to sleep and slept in until after 9am this morning. They woke up so happy! It's amazing what excites kids. Brian was happy just looking out the window most of the time. We went to the buffet for breakfast and Brian was in HEAVEN. On his plate was a waffle, a pancake, strawberries, blueberries and his own mini box of cheerios. And Gavin's breakfast was mixed with hot, buttered grits from the buffet to warm it up. He ate well, thank God. 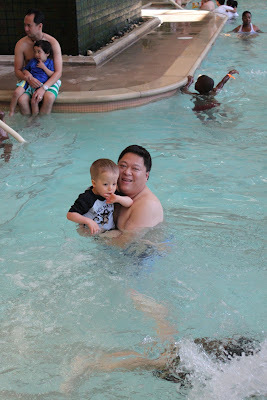 After breakfast we headed to the indoor pool. All four of us went in the pool...but only two of us stayed. 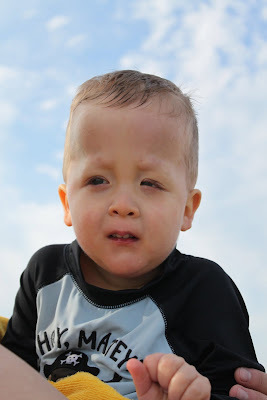 Gavin has become quite a little fish lately! He and Ed had so much fun playing in the water. 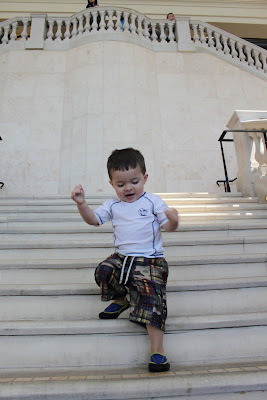 Brian was happy to test his skills walking down stairs without holding onto anything. He's very proud of himself. Before we checked out I gave the boys a bath in the hotel tub. I think that was the highlight of their stay! 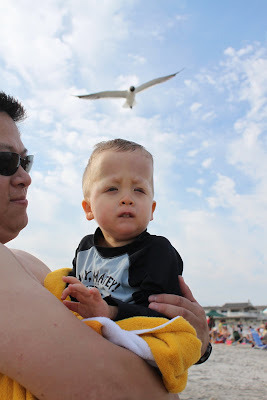 We checked out and made our way from Atlantic City to Ocean City to meet up with my family. The house is great - right on the beach! As a matter of fact, I'm sitting here listening to the ocean behind me as I write this. It's blissful. We dumped all of our stuff in the house and met everyone on the beach. My Dad even made it onto the beach, which made me so happy. Gavin had a lot of fun in the ocean with his Daddy...another thing I was happy for my Dad to see. I'm sure it didn't seem long ago that HE was out in that same ocean with a three year old little ME! Gavin came out of the water with Ed and was exhausted - but so happy. Not long after these pictures were taken, Gavin fell fast asleep in Ed's arms. He looked so adorable all snuggled up so I selfishly stole him from his Daddy so I could hold him. I walked him home and laid him on my bed where he stayed asleep for close to an hour!! Brian had a long de-sanding process outside and then a second bath of the day inside when he came home from the beach. Later, he had fun playing with his cousins and he even played "cards" with his patient Uncle Jim. After dinner we went for a stroll to a nearby ice cream shop. It was a gorgeous night with lots of flags to see on the way. The boys had another late night going to bed...but this is vacation after all. I'm throwing all the rules out the window for the next few days. I'm so happy to be with my family. Looks like you are having a reat time! Funny... I just left Atlantic City with my family (older kids). We were at the Trump Plaza..spent a day in Ocean City too.. where the kids went para sailing! Enjoy the resyt of your trip!